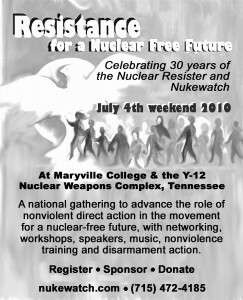 The Nuclear Resister, Nukewatch and the Oak Ridge Environmental Peace Alliance (OREPA) invite you to join us for a national gathering, culminating with nonviolent anti-nuclear direct action, July 3-5, 2010, to declare our independence from nuclear weapons and nuclear power. The gathering will be held at Maryville College in Maryville, Tennessee, with protest and action at the Y-12 nuclear weapons complex in nearby Oak Ridge, where OREPA has sustained a nonviolent campaign for over 20 years. At a critical time in the movement for a nuclear-free future, and to mark the 30th anniversaries of Nukewatch and the Nuclear Resister, we are coming together to increase awareness and action around nuclear issues, and advance the role of nonviolent direct action and civil resistance in this movement. We will also be marking the 30th anniversary of the Plowshares movement and the inaugural Plowshares Eight direct disarmament action of September 9, 1980. Come and meet with hundreds of activists from around the U.S., as we educate and energize ourselves throughout a weekend of networking, music, speakers, celebration, workshops, community, nonviolence training and nonviolent action. Because long-lived radioactive waste makes this a multi-generational campaign, we envision a gathering where new and seasoned activists can meet and strategize for the future – a nuclear-free future! We will gather two months after the 2010 Nonproliferation Treaty review conference and before the mid-term elections – a time when public attention needs to be focused on nuclear disarmament and a nuclear- and carbon-free energy future. It will also take place on the eve of the 14th anniversary of the July 8, 1996 World Court advisory opinion on nuclear weapons. This gathering is for people who advocate, practice and/or support nonviolent direct action, civil resistance and civil disobedience in the struggle to stop nuclear power and abolish nuclear weapons. Download the promotional tabloid with registration form here. Check out our facebook page – Resistance for a Nuclear-Free Future. The Nuclear Resister began in 1980 to chronicle anti-nuclear and anti-war civil resistance, with a focus on supporting the men and women imprisoned for these actions. The newsletter publishes writings from prisoners, reports on actions, trials and sentencings, provides addresses of imprisoned activists and publicizes future actions. Nukewatch has a foundation of investigating and divulging the truth about nuclear weapons and power since 1979. The organization has a strong history of drawing people together – from the missile silo fields, to H-bomb trucks on the highways, to a decade-long campaign shutting down the Navy’s Project ELF. The Oak Ridge Environmental Peace Alliance works to stop nuclear weapons production at the Y-12 National Security Complex in Oak Ridge, Tennessee, and to build nonviolent community to sustain a lasting movement for peace and justice.